So lets review; the Kiss gives S4 AP-1 and D3 damage. 14 Points. Players and Troupe Masters Start with the blade and can replace it with any of the others. A Solitaire starts with both a Kiss and Caress. Personally, I believe the Kiss to be overpriced. D3 Damage is cool, but S4 AP-1 is gonna have a hard time getting past saves. On the plus side, we get to swing it for every attack now rather than formerly where we got one good hit and three kicks. The Caress has an interesting profile and gives us S5, which is great, and AP-2, which is better! I think the pricing here is on point (do not pardon that pun) and that the damage output will be fairly reliable. The Embrace is basically a Power Sword with a fixed Strength value. That Strength being 1 higher than the model holding it. Probably priced fairly. And as for the Blade? It is literally the same as not carrying a weapon. And you have to pay for it. Lolderp, almost as bad as the Stinger Pistol, can someone get the GW editing team a "You Tried!" Award? But there is a separate thread for that complaint, moving on. My belief is that the Kiss is overpriced for what it brings to the board and unreliable, whilst the Caress and the Embrace are reliable and fair. But I have the same complaint about all of them (one that seems to be showing up everywhere). Where did the Flavour and Character go? But everyone is suffering under that yolk, and hopefully codices will rectify that. Personally I'm quite glad that I built my troupe with caresses. They seem to be pretty well balanced between cost and effect. Troupes in general are just super expensive for what you get IMO. After playing about 10 games with them in 8th so far (Against Deamon, SM, Nids, IG, BA's, Orcs and Eldar), you need a mix of Embraces and Caress. I've wound from playing and math that having 2 Caress and 3 Embraces is the best option. With re-rolls from Troupe Master, Embraces are always better! and sense i try to keep them within Troupe master range i wanted 3 of these. S5 Sometimes that S5 is just to important, so having a couple guys with them i feel is needed. If you need Multi-wound hunters Bikes are better or a unit of Kiss troupes to do just take (this is specializing at this point, against Nids with Warriors, Ravagers, Shrieks, Venoms and Zoan spam it works great b.c they have 4+ or even a 5+ save more times and with a Kiss thats a 5/6+ save that does D3 damage). No they are very well balanced, When you play them correctly 90% of all damage to them needs 4+ to hit instead of 3, they always go 1st and kill the unit, they have true hit and run, you can get key shooting units to hit with a -1 against them. Every player im going against is always extremely frustrated when i play them with harlequins b.c how survival 25 dudes can be, when a Storm Raven cant kill 3 dudes you know your good! Tho so far IMO what i've seen Nids are the hardest army for them to deal with, Mawlocks and Biovoures are F@#$ing insane! Care of share some bat reps of what kind of armies you're facing? I don't know how T3 1W models can survive even with -1 to wound vs. anything about S3 massed shooting for the most part. Are people using vehicles against you to Rhino-wall or what? Bat reps would help a ton to know what you're facing these days. You dont turn 1 or turn 2 charge (I will have some videos going up soon, im editing them now I will post a 1 page report with them after im done). I also am bad at english so thats why i dont type out bat reps (I have a extreme dyslexicia to type something out that large literally gives me head aches and makes my brain mush im on forums a lot b.c small amounts of reading and writing does help). Meatscape between combats and still move and shoot with starweavers. But how do i keep the Troupes alive? Shadowseers!, -1 to hit cast and -1 to the wound roll. If they needs 4+ to hit and 4+ to wound with a 4++ it is really easy to stay alive, with Vehicles flying around at the same time it makes it hard for them. This is some math I ran the other day with them. The number of expected wounds. Note that I only did the re-roll for hits for the Master. The Troupe is assuming a min squad of 5 all with the same weapon. The kiss is just the number of wounds before rolling for damage. I have to say they are quite well balanced. I am rather impressed. Yes but with the Re-rolls from the Master the Embraces are better than Caress. 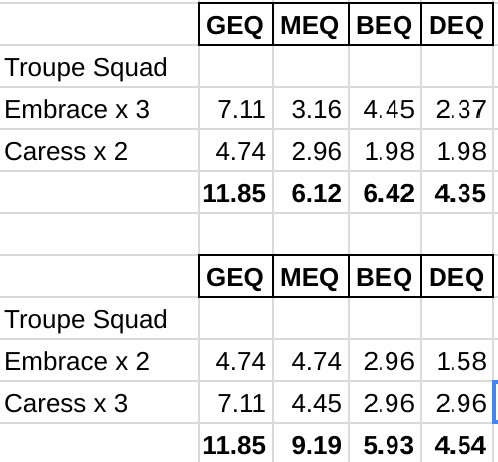 Thats why i was saying 2 Caress and 3 Embraces, you also save 9pts per troupe sqaud giving you a Pistol for same cost. And a Kiss is actually extremely strong against Multi Wound Armor 4+ or 5+ once you hit that 4/5+ save on anything with more than 1 wound the kiss is buy far the best weapon, but those units are a bit more rare. I think for the Master the Caress is slightly better. I too and curious points vs wounds against those 3. What? is that 1 attack each? or 4 attacks? Each Troupe has 4 attacks each. What is the B here? It does not look like a terminator? D is dreadnought I assume? 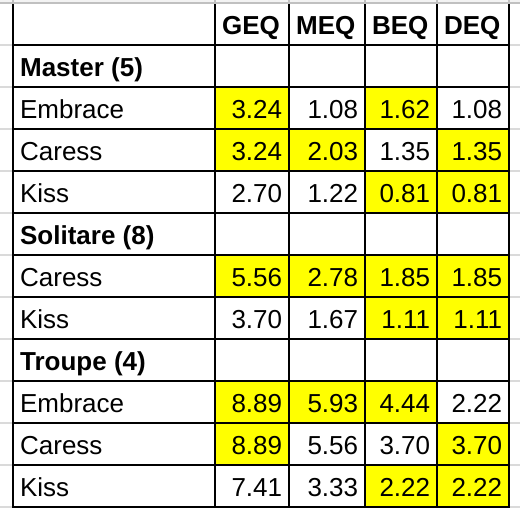 Nice to see the chart, Now idk if I want 2/3 or 3/2 of Caress/Embrace lol. I know for sure i dont need 5 of one in any unit, i feel 2/3 is a great combo for damage/point value. I agree. I know those numbers are slightly off.. I worked on it some more last night but passed out doing so. Not a big change though. I'll compare them tonight to other dedicated cc units. I think they may be one if, if not the best, cc unit in the game. And while their pistols are short range, they are nothing to scoff at either. I agree through 2-3 split is good. There is another CC unit that might be equal to or maybe better, Khorne Berserkers, this is only b.c they get to attack twice. Just look at there rules, not as good of AP and only 2/3 attacks base. They are 2 attacks (champion 3) but the weapons are not that good. Lightning Claws i'd say are the Best, -2ap, re-roll wounds and +1 attack still. So these are the numbers I am finding now. I like the Sword on bezerkers over the axe. Harlies are in range of a Master, Bezerkers of a Dark Apostate, and WraithBlades an Autarch. I am assuming that Incubi are also on t3 for the +1 to the hit die (although a roll of a 1 is always a miss).... actually looking through the rule book I don't see that as a rule... am I missing it? This could make DE VERY POWERFUL).I tried to run numbers for Banshees and Scorpions, but they need more than 5 man squads to come near the same damage. Here is what I see with Points for the units as well. I am not sure that the points for the Bezerkers is right.... would love some double checking on that.